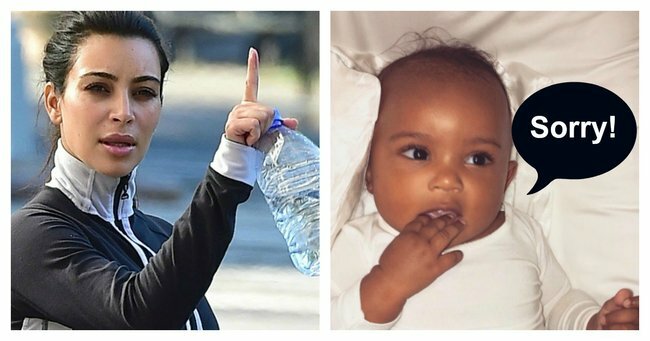 Kim Kardashian isn't happy with Saint West first word. Saint West just said his first word and Kim Kardashian is very disappointed. Kim Kardashian doesn’t seem to lose very often. The last time someone tried to publicly challenge her, she whipped out months-old video footage of inconsequential conversations and gave us one of the most brutal smack downs of this year. And even if the woman begins to lose at something, she could probably pay her way out of it. Or just get her sisters to tweet about it. But just this once, the world’s most famous woman can’t win. Because even though she named her child Saint under the illusion he would forever be good and holy and eternally obedient, we’ve just learnt that canonising your child before they can speak doesn’t mean they’ll be kind and loyal to you. Although she grew that boy in her belly for nine months and gave birth to him, Saint West’s first word to the world was ‘dada’. Talking to E! News on Friday, Kardashian admitted Saint’s first word had nothing to do with her at all. “He said ‘dada’ today, three times and I was like ‘what’?,” the reality star, 35, said. In what comes a surprise to exactly no-one, Saint West already knows his dad is king of the world before he knows what the word king actually means. Kanye’s probably sorry for the realness, we imagine.